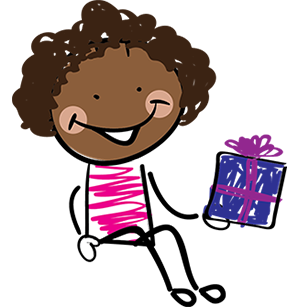 Emani enjoys reading and playing educational games. A tablet will help Emani to excel educationally with learning through different apps and online educational programs. Emani is an exceptional little girl with many talents. Emani has received an exceptional reading award in school and has been setting positive examples for children in her age group. Emani has been known to have a smile that could light up the room and a great sense of humor. Emani loves to sing, dance, and help others feel welcomed wherever she goes. Greater Hope Foundation requests this wish for Emani. Robin grants the wish for Emani! Thanks Robin. "You are an awesome girl! I hope that you enjoy your gift! Learn a lot and have fun! Merry Christmas!!" One Simple Wish sends the gift to the Greater Hope Foundation for Emani. Emani receives the gift from Greater Hope Foundation ! "Emani was thrilled to receive her wish! She has been using it a lot especially for educational activities . She is a bright girl and is continuing to excell with the learning opportuities on her tablet. Thank you so much!" Want to Help Children Like Emani?